If you are interested in learning more about astrophysics or gravity, then there are many different outreach activities you can indulge in. I would encourage everyone to get involved! I regularly help out with lots of different activities, from school workshops to public talks (and, of course, blogging). One of the more interesting projects I have been involved with e-x-p-a-n-d-i-n-g the history of the Universe in 45 min, an performance combining poetry, music and astrophysics in a planetarium dome as part of Stratford Literary Festival. To celebrate the recent developments in gravitational-wave astronomy, I was part of the team behind the Listening to the Universe exhibition at the Royal Society. Recent talks include the Universidad Técnica Federico Santa María (11 January 2018), the Lichfield Science & Engineering Society (15 February 2018), Sonoma State University (20 March 2018), Charles University (10 May 2018), Geneva Lake Astrophysics & STEAM (18 March 2019). 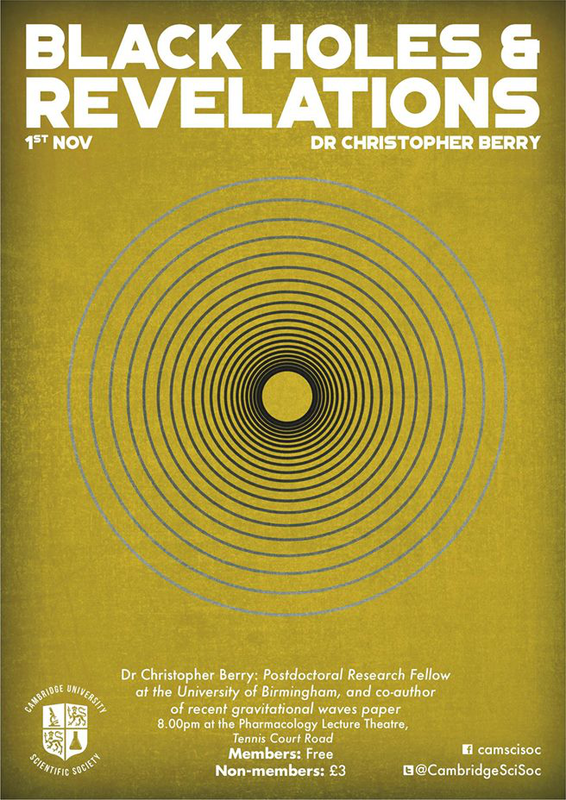 Awesome poster designed for a talk I gave to the University of Cambridge’s Science Society in 2016. If you feel like dropping by Evanston, CIERA often hosts public events. The historic Dearborn Observatory is open every Friday. When it is clear, there are some beautiful views through the telescope. The last Friday of every month, there is a CIERA Astronomer Evening at Dearborn as well. Come along to hear a talk by our researchers, and have a friendly chat while waiting to see the telescope. I’ll be giving a talk 31 May 2019. If you are in the Midlands (apparently the region most interested in astronomy), then the Astrophysics Space Research Group runs public outreach activities. Particularly exciting are the regular Astronomy in the City events which I developed and ran. The Gravitational Wave Group participates in a wide range of activities, including the Royal Society’s Summer Exhibition (2017); we organised some events to coincide with BritGrav, and recently put together an exhibition for the Thinktank museum. To coincide with the announcement of LIGO’s detection of gravitational waves, I helped to create the video below. If you are lucky enough to be in Cambridge, the Institute of Astronomy hosts a selection of different outreach activities. There is a public open evening every Wednesday during the winter season, which I can vouch for being excellent. I have previously given talks on solar neutrinos, the Earth’s gravity, detecting gravitational waves in space and the Big Bang. If you prefer to stay behind a computer, then you can keep up-to-date with science news following me, CIERA, LIGO, the University of Birmingham Observatory, or the Institute of Gravitational-wave Astronomy on Twitter; feel free to ask any astrophysics questions! For a small burst of procrastination, I made a gravitational-wave wordsearch for the Institute of Astronomy open afternoon. For more serious procrastination, check out our citizen science project Gravity Spy (I’m currently level 4). If you’d like to do some reading, I’d recommend the LIGO Magazine: I’ve contributed a couple of articles on parameter estimation, and understanding our signals. I’ve also been quoted in articles by Symmetry on Advanced LIGO (March 2014—I was right about the gamma-ray bursts); The Guardian on the detection of GW170104 (June 2017—I was extremely excited at the time) and on testing a model of string theory (July 2017—no signs of breathing modes yet); the BBC on our end-of-O2 results (December 2018), and Gizmodo on looking for hierarchical mergers of black holes (March 2019) and the exciting start of O3 (April 2019).